The most powerful Laser Rangefinder in the world. The Pro X7 features incredible ranging capability (550+ yards to a flag). The Pro X7 is accurate to 1/2 yard. Features 7x magnification with HD optics. The Pro X7 is waterproof and tour certified. Designed exclusively with the bottom of the cup in mind, this mode allows easy acquisition of the flag without inadvertently capturing background target distances. When more than one object is acquired, the closer of the two objects is shown on the LCD display. JOLT Technology eliminates all doubt by delivering short vibrating bursts to reinforce the laser has locked onto the flag. Use what the Pros use, feel the exact distance. FEEL THE JOLT. E. S. P. 2 provides yardage faster and more accurately than ever before. Not only has Bushnell increased the acquisition speed to a lightning fast lever, E. S. P. is so accurate that from 5-125 yards the distance is displayed to 1/10th of a yard. 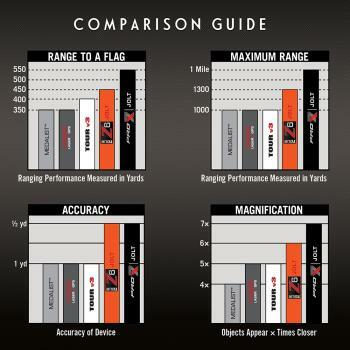 Whatever your skill level, Bushnell gives you the most accurate technology in the game - and you'll have the confidence of knowing you have the exact yardage for every shot you'll ever hit. 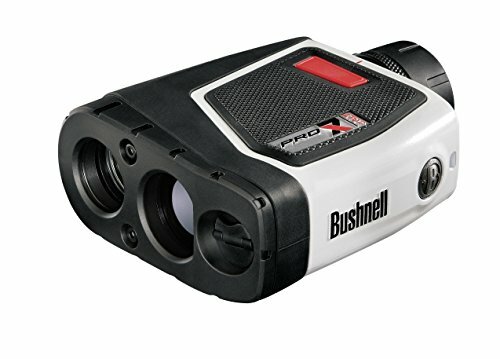 Created specifically for Bushnell's premium rangefinders, the Tour Z6, Pro 1M and Pro 1M Slope, this optical enhancement dramatically improves contrast, clarity and light transmission, while increasing the brightness of digital readout information for rapid, positive identification in all lighting conditions. It's simply the best of heads-up projection displays. 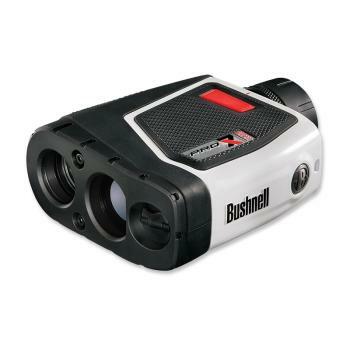 Bushnell's laser rangefinders use an invisible, eye-safe Class 1 Laser beam (as classified by the FDA) which is "bounced" off distant objects with the press of a button. Then, the rangefinder's high-speed digital clock measures the time it took for a laser beam to reach a target and return to the unit. Next, using advanced digital electronics, the rangefinder instantly calculates the distance within +/- 1 yard and shows the range in either yards or meters on a through-the-lens LCD Display. The entire process is so fast that less than a second elapses between the time you press the button to generate a laser beam to the time the exact range to your target is displayed.